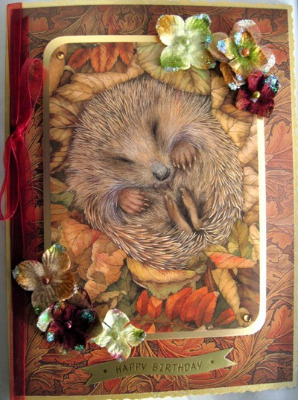 This enchanting picture of a sleepy hedgehog is set on a background of leaves in reds and browns, on a gold sparkle deckle-edge card 150 x 203mm (6" x 8"). 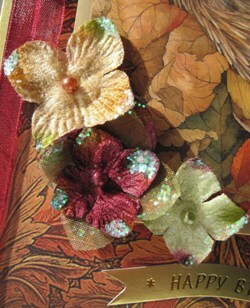 It is embellished with fabric flowers in green, gold and burgundy and wrapped in burgundy ribbon. A gold banner reads Happy Birthday.